There are so many different kinds of kitchen knives on the market today. Many of them claim that they can improve your cooking experience. One that’s growing in popularity is the Damascus knife. What is a Damascus knife? How much easier can it make your preparation for cooking? Let’s look at the details and benefits of Damascus kitchen and chef knives, what to look for in buying one, the best knives on the market, and how to care for them after purchase. What is a Damascus Knife? A single type of steel is flattened out, then folded to produce layers. A composite of steel and iron is welded together, then put through repeated heating and forging to manipulate it into a desired shape. A chef knife is a kitchen knife used for a variety of purposes. It is a large knife which usually measures eight to ten inches long. It features a blade that curves upward along its length and ends in a narrow point. It can be used to chop, slice, and dice many different kinds of foods. The chef knife is one of just a few knives recommended for the average home cook – the others include a paring knife and serrated knife. Materials used: Make sure that you know which types of materials have been used to create the blade of the knife. Some types of steel will be stronger and more durable than others. Rust-resistant: Check that the blade features stainless steel. This will help to avoid rust, which makes caring for the knife easier on you. Specialty knives: It’s always best to choose a knife that has been created specifically for your purpose – in this case, chopping and slicing foods for cooking. Try to stay away from knives which are general purpose, but claim to be “just fine for kitchen use”. Aesthetics: A Damascus knife is intended to last for a long time, so choose one you’ll be happy with. Look at different designs and choose one that you love. So, let’s check out some of my favorite Damascus chef and kitchen knives. This beautiful knife is custom-made by DKC Knives. The blade measures 7.5 inches and features a warbled design. The handle features green wood, gold accents, a brass bolster, and has a solid, well-crafted feel to it. Each knife is handmade by artisans. A leather sheath is included to protect the knife when not in use. Each knife is well-oiled out of the box, so it won’t rust during delivery from moisture. Two options are available: D2 steel or 440C steel. The 440C steel is stainless steel, which is resistant to rust. There may be imperfections and blemishes in the metal, due to the handmade nature of the knife. This chef knife from Zelite Infinity features a simple and sleek look. The blade has a wavy design, measures eight inches, and is made from 67 layers of Japanese steel. The dark handle is simple, but elegant, with a hefty weight in your hand. The overall look of the knife is simplistic and sleek. 67 layers of Japanese steel lend stability, strength, and durability to the knife. The knife is stain- and corrosion-resistant. There is minimal resistance during slicing, making the preparation of any meal easy and quick. The knife is non-stick, so you can keep slicing or chopping without stopping to pull ingredients off the knife. Stainless steel helps the knife to avoid rust. The handle is riveted to the tang with mosaic rivets. This adds strength and durability. The handle is rounded for a comfortable and secure grip. The handle is resistant to moisture, heat, and impacts, allowing the knife to last longer. The knife contains high-carbon steel as well as stainless steel. Though stainless steel resists rusting, high-carbon steel is more prone to rust. To be on the safe side, you should wash and dry the knife as soon as you’re done with it and keep it oiled. The knife can feel heavy and unbalanced, which might make it difficult for some people to use. It is not recommended for chopping. The curve on the back of the knife makes it difficult to use the entire length of the knife for chopping. The knife can develop rust and chips after prolonged use. It needs to be sharpened about every three days of regular use. This chef knife is made of Japanese steel and includes a black sheath. It’s vacuum-treated and features a hammered finish. The knife measures eight inches with a sharp edge and mirror polish. It’s a very nice knife, almost decorative. The blade has a very sharp edge, making it useful for slicing anything, even tough meats. It is hand-finished and polished at 8-12 degrees per side. This is done using a traditional method, known as the 3-step Honbazuke method. This reduces drag during cutting and keeps food from getting stuck on the knife. It is nitrogen-cooled, which increases flexibility and resistance to corrosion. The knife is triple riveted and features a full tang for resilience and stability. It’s balanced for ease of use. The military-grade G10 black handle is hand-polished, durable, comfortable, ergonomic, and resistant to heat, cold, and moisture. A black sheath is included to protect your knife. The high-carbon steel can be prone to rust. The knife should be washed, dried, and oiled after each use. The metal is relatively soft and can therefore be chipped. The knife feels heavy and unbalanced. The blade of this chef knife, made by the Etsy shop BlackBeardShop, is made of stainless steel and features a swirled design. The handle is made of walnut wood. The blade measures seven inches, for an overall length of 12 inches. The stainless steel blade will resist rust and stains. The walnut handle is strong and durable. The handle is curved, allowing it to conform to your hand for a comfortable and secure grip during use. Three rivets secure the handle to the tang of the blade. Care instructions for the knife recommend keeping it away from all moisture and oiling it often. Though this is a good practice for any knife, it may also indicate that the steel is not as rust-resistant as it should be. This Damascus chef knife is the Executive Chef offering from Zelite Infinity. The blade measures eight inches and features a swirled design. It has 67 layers of Japanese steel, a tsuchime finish, and an air-blade design. It combines the beauty of Japanese steel with the weight and strength of German knives. Like many other Damascus knives though, it feels a bit heavier than normal in your hand. The Japanese steel is stainless, strong, and durable. The ultra-deep blade measures 57 millimeters, allowing for knuckle clearance and efficiency during cutting. The knife is non-stick, allowing you to slice or chop without stopping to “un-stick” foods from the blade. A Rockwell Hardness rating of 61 makes sure your knife will resist impacts and last for a lifetime. The knife can resist rust, stains, and corrosion. The handle is strong and durable. It is triple-riveted to the full tang for extra strength and stability. The rounded handle and tapered bolster provide comfort during cutting. The knife is not as sharp as expected. The blade is not sharpened evenly. The handle is too short and feels awkward to hold. The edge does not stay sharp for long. The knife feels heavy, making it difficult to use. This chef knife from Four Mogils comes as part of a set. It arrives inside a bamboo gift box, which doubles as a handy travel case and folds out into a cutting board. The blade is made of Japanese steel, measures eight inches, and features a unique ring design. A simple black handle completes the sleek look. The set provides everything you might need at home or on the road: a beautiful chef knife, convenient carry/travel case, and cutting board. The Japanese steel is strong and durable. The edge is razor sharp, allowing you to cut tough meats and vegetables with ease. The black handle is moisture-resistant and balanced. The blade is not extremely sharp and needs to be sharpened between each use. This Santoku chef knife from BlackBeardShop features a Damascus steel blade and wooden handle. The blade measures 6.5 inches, for an overall length of 12 inches. The handle is made of black walnut wood. It is flat with a slight curve. The overall feel in your hand is professional and comfortable. The Damascus steel is strong, durable, and beautiful. The handle has a slight curve to it, making it comfortable to hold while cutting. Stainless steel pins secure the handle to the tang of the blade. The knife must be kept away from all moisture and well-oiled. It rusts very easily, even within an hour after washing. For this reason, it must be dried thoroughly right away and kept in a completely dry location. The knife does not have an even edge and has a gap in the middle of the blade. This Damascus chef knife from Daddy Chef features an eight-inch blade made of 67 layers of stainless Japanese steel. The dark brown handle is a military-grade G10 handle with an ergonomic curve. The Japanese steel blade is strong and long-lasting. It features stainless steel, which will not easily rust. The handle is moisture-resistant, durable, and comfortable. The knife features a full tang and triple rivets for added stability and strength. There is minimal resistance when slicing. The knife has a non-stick blade. There is a 12-degree edge on each side of the blade. 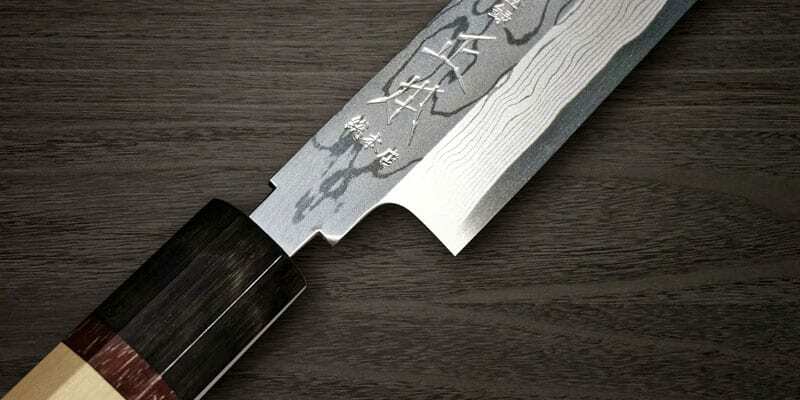 The Japanese steel blade features both stainless and high-carbon steel. Though stainless steel can resist rusting, high-carbon steel is more prone to rust. For this reason, it’s advised to thoroughly wash and dry the knife immediately after use and oil it often. The knife is difficult to hold and use when cutting thick items, such as onions. The knife tends to feel slightly off-balance. Most Damascus knives are not prone to rusting, but it really depends on the material used to make the blade. If it uses a type of stainless steel, it will not easily rust. If it is made from high-carbon steel, then it may rust, so special care is recommended. The knife should be cleaned and dried immediately, and a layer of oil should be applied as well. Never wash a Damascus knife in a dishwasher, as this will wear down the metal and cause chipping. Damascus knives should be sharpened every so often. However, how often you sharpen them will depend on how resistant the blade is to wear. 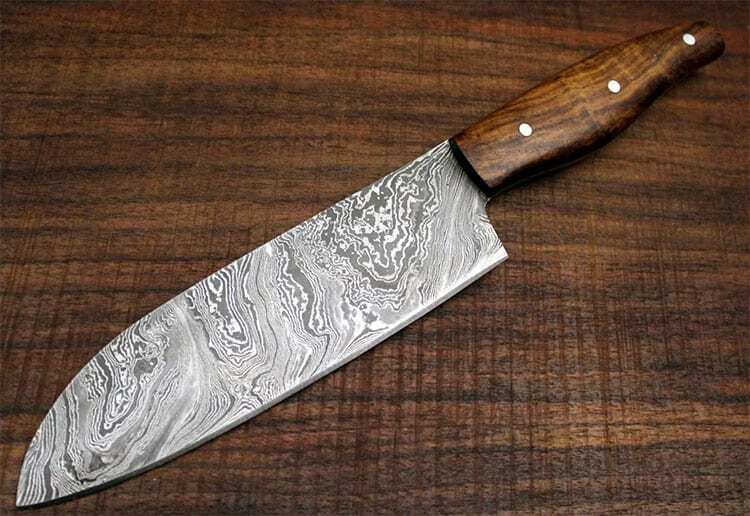 Damascus steel is a good choice for chef and kitchen knives. It offers many benefits, including beauty, strength, durability, and resistance to rust and stains. Chef knives especially benefit from Damascus steel construction technology. It’s important to shop around when considering the purchase of a Damascus kitchen knife, since they are not all created equal. And once you’ve decided on one, you should know how to properly maintain your knife. But no matter which Damascus knife you settle on, you will not regret your purchase – it will add beauty and efficiency to any kitchen.